In June 2012 the gompa became home to our fist group of novices, aged 7 to 11. This group came from the Karnali zone of Mid Western Region of Nepal, specifically from Jumla and Dolpa districts. 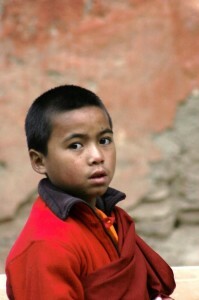 Their families agreed to the boys being taken into the guardianship of the gompa. 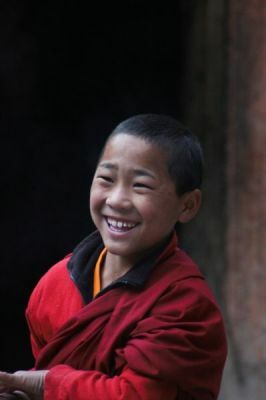 Due to their young age and lack of previous schooling, they initially attended secular education at the primary school of the adjacent Tibetan camp, learning Nepali, Tibetan and English. They spent the winter of 2013-2014 in Pokhara where they began more regular monastic studies under the guidance of Lopen Sonam. Later the original group of monks were joined by more young novices, from Kathmandu and locally, as families asked Shashi to take their sons into his care. The five original monks were taken to Choede monastery in Upper Mustang, though Norbu was taken home by his father from Pokhara after falling off some stairs! Once the gompa was handed back to the community, the remaining monks were brought down to Tukuche briefly and five families agreed to send their sons to Kathmandu. Pema Gyalpo was 7 years old when he came to Chhairo in spring 2014. 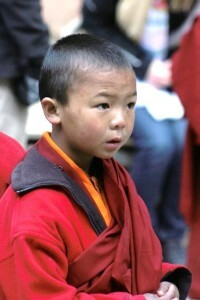 He is a quiet contained little boy, who had already spent some time at the Karma Samten Ling monastery in Kathmandu. He is now back at Karma Samtenling following the gompa handover. Dawa came to Chhairo in spring 2014 when he was 6 years old. His family is from Gorkha. Many of his elder brothers and sisters are also monks and he has already spent some time at the Karma Samten Ling gompa in Kathmandu before coming to Chhairo. He is now at Karma Samtenling’s small monastery in Lumbini. Tshewang is a local boy, from Myagdi district just south of Mustang, and was 11 when he came to Chhairo in 2014. He has not attended much school and is often seen daydreaming in class. He’s doesn’t say much but has a fabulous smile which wins him friends. His family did not want him to go to Kathmandu and so he remained in Jomsom. Tenzin was the smallest of the 2014 monks which earned him the nickname ‘Puche’ (small). He was 5 when he came to Chhairo. He is a happy little boy and comes from Tukuche, Shashi and Chakra’s home village, about an hours walk south of Chhairo. He now attends the Kagyu school in Tukuche. Pemba was the oldest of the original Jumla monks, at 12 in 2014. He was one of the brightest students in the group, and liked to sketch taking inspiration from his surroundings. His lama name Pema Wangchhu which means “Lotus Blessed One”. 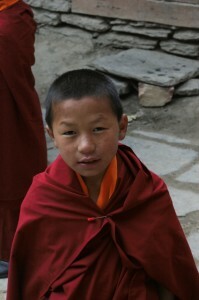 He has since moved to a larger monastery in upper Mustang. 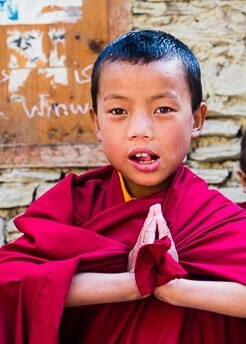 Tsering’s lama name is Pema Dechen which means Lotus Heaven. He came to Chhairo in 2012 but moved to Upper Mustang in winter 2014. Tsering came to Chhairo in 2012 from Dolpa district in Mid West Nepal. He is also now attending the monastery in Upper Mustang. Karma Sonam’s lama name is Norbu Tsangpo which means Great Gem. He came to Chhairo in 2012 from Jumla district in Mid West region. He went home to Jumla in late 2014, but later joined the monastery in Upper Mustang. Norbu was the youngest of the original group of young monks who came to Chhairo in 2012. He was collected by his father from Pokhara in winter 2014 and returned to Jumla. 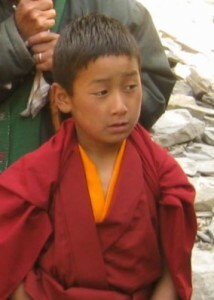 Pema was part of the first group of six monks who came to Chhairo in 2012 when he was 10years old. In late autumn 2013 Pema’s parents asked for him to come home. As their only child they missed him and felt that his monastic education was not progressing as fast as they would have liked. He returned to Jumla with his father in October 2013.